For a design enthusiast or a small-scale technician, a mini mill can become the best possible tool to get the job done. In the past, you wouldn’t even see these miniature milling machines. As a matter of fact, they were only found in large workshops, who had a long-term use for it. In short, they needed such machinery on a daily basis.Then why are we babbling about the best milling machine? Well, with the rise in numbers of the freelance workforce, experts began thinking as to how could you make a mill smaller. By spending an enormous amount of time and effort, they’ve finally come up with small-scale models of milling machine which are becoming popular each day. But with so many options that feature various configurations, it is never easy to get your hands on the particular product that can take care of all your needs. 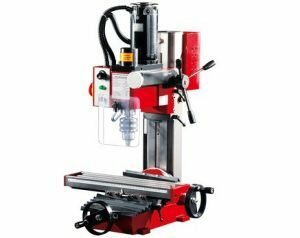 So, in order to save you the trouble of excessive thinking, we have come up with some of the best mini milling machine reviews. In the reviews, we won’t just be talking about the features and their benefits. As a matter of fact, we will also be focusing on the things we don’t like and pointing them out specifically. So, without further ado, let’s get started! Now that you’ve had a glimpse of the products we are about to showcase, it is time for us to dive a bit deeper into the products themselves. As we mentioned earlier, we will be doing a thorough sweep regarding the pluses and minuses of each product. Also, after the reviews of the best mini mill, we will be talking about things like safety and operation, which are essential if you are looking to get into designing or repairing parts with a mini milling machine. First of all, we are looking at a pretty decent form factor with a relatively low price tag. For the most part, it should fit right in and lend a hand with all of your chores. This product should be more than enough for novice and intermediate users, as it only fashions itself with the most needed features. Speaking of the most needed features, we do have a variable speed 100-watt motor which runs at standard voltage requirements. Now you have a 5000-rpm speed which goes all the up to 20000-rpm. It may not be much, but it’s not too bad either. For small electrical projects and design works, it should be more than enough. Then you are looking at a decent size table with respectable dimensions. It is sturdy enough and does help out a lot with adjustability. The 200x700mm table should be just fine for jewelry, electronics, lab, and other small-scale projects. Also, the table features 3-T slots with an adjustable ruler, making the positioning of the workpiece a breeze. When it comes to the overall build quality, for the price, you can’t really expect anything more. The vertical columns and compound lathe both feel premium thanks to the aluminum treatment. Moreover, you adjustability on all axes, which is nice. Considering all these aspects, we can certainly label it as the best proxxon milling machine review so far. Overall, for the newbies out there, this is the perfect mini mill to get started. Of course, with such an aggressive price tag, you shouldn’t really expect anything out of the ordinary. But it does take care of all the basic operations. So, we are not at all afraid to recommend it. The pricing is very competitive. The build quality features high-quality aluminum, offering premium working experience. The 24-pole motor offers good rpm with general working requirements. The table features a 3-T slot design with a variable ruler, offering good accuracy and positioning. All the wheels are adjustable with an overall accuracy of 0.002mm. Weighs a mere 15.5 pounds, offering good overall usability. The motor operation remains stable enough to offer a precise finish. The X-axis is a bit cranky. It also suffers from excessive noise production. At the second space of the list of 10, we have got a kkmoon mini metal lathe review, the reputed manufacturer. Although this machine is not for milling works only, but there is a number of reasons to put this product on the second spot of the list. We will go one by one. First of all, this one is a 6 in 1 mini lathe machine. So, you can not the only mill but also saw, grind, drill and lathe with this one. You see, these are basically the tasks that every garage worker, woodworker, plumber or handyman has to deal with. So, as per our concern, it’s an all-in-1 machining tool. Now, who are the people who can use it? And what are the type of jobs? Well, if you have anything like DIY hobbies, crafts, small parts processing, project designing and so on, we think this as an ideal pick for the money. Worrying about safety? KKmoon had been well aware of it before you were. This mini lathe machine gives you a solid risk-free construction that is durable and non-reformable. In case of safety, while using, you can avail a pair of protective gloves with the package itself. This will come in help while you’re working with it. Specially for protecting the eyes and hands, this pair of gloves will come as a blessing. 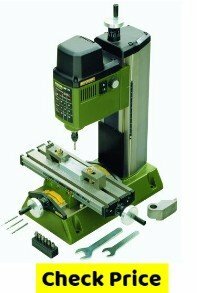 Overall, this best mini mill and lathe machine will be an all-in-one solution for all of your machining works. you can sincerely think of owning it for yourself. 6 in 1 operation are able to be done with it. Sawing, grinding, milling, drilling etc. are the main jobs. Its body is made of advanced aluminum allow. Can be used for quite some years. Comes with a protective glass pair. Operating the machine is quite easy. Contains a handful of parts. Quite expensive in terms of price-quality ratio. 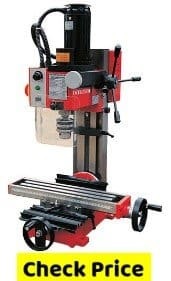 If you are looking for a dwarf version of a full-form milling machine, Erie Tools Mini Metal Milling Lathe is the product we’re recommending. This erie tools mini milling machine comes to be a little bit expensive. But wait till we explain you all the essential features that it comes with. We’re sure it’ll serve you up to your heart’s content. 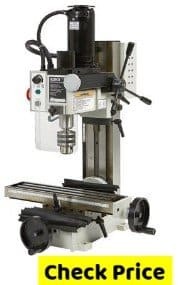 This machine from Erie Tools includes a lathe machine, a chuck key, five different pieces of carbide jaws, 11 feed rate gears, a set of external chunk jaws and of course, the manual. All in all, this set is quite enough for dealing with all the basic machining works regarding metals. Moving forward to its operations that we’re able to do with it, there comes drilling, cutting, turning metals. Also, you can take woods, plastics parts as the jobs. While it comes into metal works, precision is what most of us look for. With this tool, the problem is likely to be solved. It has a variable speed to work on a 7 inches x 14 inches platform. So, small jobs are very well suited to be done. Also, motor power is another of the important concerns. The motor can rotate with an amazing speed of 2500 RPM in both anti-clockwise and clockwise direction. For any kind of jobs done at garages or workshops, this is quite a good one to go. Also, for people who’ll put a question mark on the price, may get their answer of why it costs so much. Thread indicator is another plus point of this mini mill. It will help the user to turn screw threads within a range of 12 to 52 TPL. Amazing right? From an overall point of view, this product seems like a bang for the bucks. Specially for those who want to deal with heavy workloads within a little space taken for the machine, this one is the go-to pick. Hope you found this mill worthy. Includes all essential parts and features. Can drill, cut, turn and mill metals. has a variable speed of 2500 RPM. Comes with a thread indicator. The price-quality ratio is too high. For quite some years, Jet Machinery had been a popular name among the machinists. This time, we’ve picked up a comparatively newer product to place at our number 4. 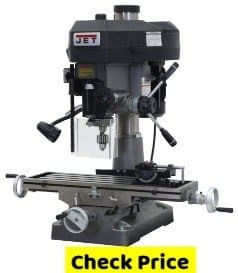 It’s called the JET JMD-18, and we’ll tell you on this jet milling machine review why it’s worthy. You may not have the same size of jobs to deal with your mini mill. In case you have quite bigger jobs in hand, this one will support with its big work table. The size of the table is 9.5 x 31,75 inches, which is quite okay to go. Moving forward, it’s about motor power. This product features a 2HP motor power that runs on regular ac power of 230 volts. You can switch between 15 to 3000 rpm with the help of 12 spindle needles. You can also experience a minimized delay and quick transports while working. What next? Well, the next significant feature that we would like to show you is, the cast iron column and heavy duty roller bearings. You may ask- why having these is important? When you have a strong supportive column made of cast iron, things become a lot easier. It will give you the freedom to handle heavier working metals, as well as a firm support. And the heavy duty roller will also help to support the spindle and ensure greater tolerance. Easy to read depth gauge is the next good thing about this mini mill. The depth gauge that comes with the machine, is quite easy to read. This is a serious benefit whenever you’re working with metals. Also, a 360 degree rotating swiveling head for precision comes as an additional feature. A 2 HP motor for power output. Cast iron made the column. Easy to read depth gauge. Dedicated to both small and heavy jobs. When it comes to micro works, it’s not quite a good fit. At this point of the review, it’s a quite pricey mini mill that might let you raise an eyebrow at first. But hey, we’ve got some reasons when we put a product at the best mini mill list, right? The main jobs that you can handle with this machine are- milling, drilling and facing. Although there are other metal works that we have to do, these three are most frequent of them all. 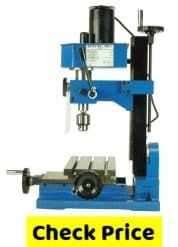 This machine can deal with 1/2″ drilling 1/2″ end mills and 1″ facing when its time to act. Also, belt changing is quite a trouble that bothers us quite often. But this mill will put a smile on your face. Because, like other mini-mills, this one doesn’t need a frequent change of belts, which will save both of your time and money. Among the other significant features, we have a dovetail column, a safety shutoff switch, an adjustable depth stop, a fine feed control, a feared drive, a clean guard on the spindle, rubber chip guards for protectors and zero settings dial reads. The dovetail column is adjustable, which gives it another touch of awesomeness. Like many of the other motors, the motor of this mini mill is up to 2500 RPM rotational power. However, based on the purpose, you can control that from 0 to 2500 RPM easily. Now come to the point of price-quality ratio. What it gives for the price, is quite worthy and even better than some of the heavily pricey machines. As it requires less maintenance and less occupation, you can certainly give it a try. Contains a safety shut off switch. The depth stop is adjustable. There is a fine feed head control. The clear guard on the spindle. No belt change is required. Can’t deal with heavy work metals. The tool that we are going to talk about at this point is the Erie Tools Variable Speed Mini Milling Machine, another master production from Erie Tools. 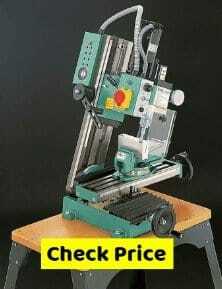 It’s a mini milling machine with variable speed that can do benchtop drilling as well. It comes with a high-speed steel 6 pieces 4 flutes also with ⅜ inches shank cutter. The set includes a long range of cutter sizes. Also, it can do both end milling and face milling. The end milling capacity is ⅜ inches, and the face milling capacity is ⅝ inches. The table size may be an important factor because mini mills usually don’t come with large tabletops. In this regard, this one comes with a table of 9.45 inches x 5.70 inches table. From a workers perspective, this seems to be quite fine. Now, let’s come to the spindle and motor speed. This machine feature two kinds of speed variation- the high and the low. The low range of speed lies within a range of 1-1000 RPM, where the high end lies within 0-2000 RPM. As you’re buying a machine milling system for home and non-commercial use, this seems to be quite fine from our point of view. There is also some other feature that might add some more value to it. Among them, the most significant features are- safety shut off switch, Forward and Reverse switch, geared drive, lifting hand wheel, crossfeed hand wheel, fine feed hand wheel, a clear guard on the spindle, rubber chip guard, variable speed control etc. From the whole sense, we found it as a bang for the bucks. Hopefully this erie tools mini mill review helps you a lot, that might please you as well. Can do drilling, deep milling and face milling. Has both forward and reverse switch. Jas a spindle speed of 0-2000 RPM. Motor power is limited within 2000 RPM. The machine we have in hand right now isn’t a mini milling machine merely. Where mini-mills come in a smaller size, this one is a little larger. But once you’re done with analyzing the tasks that it can handle, you’ll be amazed for sure. The product name is OTMT Variable Speed Mini Milling Machine and we’ll explain it features to this otmt milling machine reviews. The OTMT Variable Speed Mini Milling Machine has a number of handy features, such as a variable speed control, gear drive that can save much of your time while working. While machining works are being done, saving time is important, isn’t it? The control and accuracy is another important feature that machinists look for a lot. In that term, it will put a smile in your face. The head can be tilted up to an angle of 45 degrees in both left and right side. This gives the firm control we’re talking about. There is a pretty fine feeding system along with a coarse feed that helps in drilling. Also, the dial is pretty easy to read, which shows up to .0001 inches of increment. So, getting the right setting for the right job becomes pretty much easier for you. The motor, which is of 1/2hp, has two variable speeds. The low range can offer a speed range of 0-100 RPM. On the other hand, the high end of speed delivers a range of 100-2500 RPM. The table size seems pretty fine to us. It gives a dimension of 15 inches x 3-½ inches and can also travel a decent distance. The spindle range is -45 degrees to 45 degrees of rotational angle. And this is the most unique and value adding feature of the whole mini mill. Among other important features, there is both forward and reverse traveling capacity, traveling capacity of both right and left for the table and so on. Variable speed and firm control. Can tilt up to 45 degrees. Has a coarse feed for drilling. An easy to read dial. Can read up to .0001 inches of moves. Speed ranges from 100-2500 RPM. Can move both forward and backward. Motor power seems to be a little low. Klutch Mini Milling Machine is our 8th best mini milling machine that has a lot of good qualities that any good mini mill should have. Upon many features, we will go explain one by one on this klutch mini mill review. First of all, when we found the motor speed to be as good as ¾ HP, we were pretty much surprised. The variable speed motor has two-speed gearboxes that can deliver up to 350 watts of power. The speed can be anything from 100 RPM to 2500 RPM. Milling head and column can be tilted within an angle of 45 degrees, both in left and right side. This can give you to handle larger operations with your mini milling machine. The worktable size is pretty large and enough to handle both small and large-scale jobs. Another plus point of Klutch Mini Milling Machine is, it features a 360-degree swiveling head. This is once again, help you to increase the range of works. The length of both longitudinal travel and cross travel is pretty important in case of any milling machine. In that terms, this one gives you a longitudinal traveling distance of 4 inches, and the cross distance it can cover is 7 inches. Feed controlling up to perfect limit is another of its important features. And surprisingly, all these features come with a good price range that’s affordable. Hope you found the list of features perfect for indoor machining works. Tilts up to an angle of 45 degrees. 7 inches cross traveling distance. 4 inches longitudinal traveling distance. Can rotate up to 2500 RPM. No stand comes with the model. A good variation in the gearing capacity is every machine works demand in their milling machine. But when it comes to mini mills, this becomes quite a rare feature that we can find in any models of the market. At this point of the precision matthews mill review, we’ve found a model that’s comparative new in the market but features a rich set of features. The first thing is, it has a 6-speed variation geared head. Which is hardened and grounded for maximum reliability. And when it comes to a machinist’s work, this comes to be a very handy feature. Setting up this one is pretty much easier, comparing to other sorts of mini mills. As you can see, it doesn’t come with any stand. But once you get one, you can set it up virtually anywhere you want. For your set up, no additional circuitry is needed anymore. The size is pretty much compact, so it can be easy to transport and set up. Alright, let’s talk about the power now. The maximum drilling capacity is 1-¼ inches, maximum ending capacity is 1 inch. Also, the maximum face milling capacity is 3 inches. It can cross travel a distance of 8-½ inches. Also, the longitudinal travel and vertical traveling distance is 15 inches and 16 inches consecutively. The maximum distance that the spindle can travel within the table s, 15-¼ inches. The motor speed is pretty much decent. It’s 115-1700 RPM. Which seems pretty much fine. High precision tapered roller bearing. Can be titler up to 90 degrees. 1700 RPM seems a little low. This product from Zinnor is a six in one micro woodworking lathe machine. It can be converted into six different types of machines- the jigsaw machine, the drilling machine, the sander machine, woodworking lathe machine, milling machine and of course, metal lathe. When it comes to security, Zinnor does no compromise. It provides 100% security with the overheat protection that ensures safe operation. The specially designed of the blade ensures safety in operation. Even in the case, the sawtooth touches the skin somehow, it will create a tiny vibration. Also, it ensures protection against over current flow, over voltage flow, overheats flow and so on. The machine is pretty much efficient and saves a lot of time. With the motor power of 20,000 RPM, which is one of the biggest power so far. Another question we often get is, it’s suitable for multiple types of works. Such as DIY, production creations, micro level metalworking, project designs and so on. So, if you’re a professional or a hobbyist person, this one is an on-the-go product. Comparing to the features and prices, we find it as a good one. You can definitely go for it. 6 in 1 kit for multiple purposes. 100% safe and secure to operate. It saves a good amount of time. It serves different types of works. Not for heavy metal works. Now that you’ve had a glimpse at the products, you should be able to know which one you are going for. Also, our mini mill comparison should give you a really good idea about the base specs, which should give you a very good idea about each of the milling machines. But what happens when you want to go for something else? Well, you’ve got you covered there as well. We will be giving you a series of instructions that may come in handy whenever you’re going shopping for the best mini mill. If you are reading this review, then, of course, you are a capable engineer. But as you are well aware of the fact that there is a huge number of products in the marketplace. Amongst so many options, it is very easy to get lost. 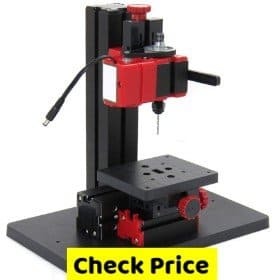 As a matter of fact, after scrounging through so many options, many users, as a matter of fact, buy a milling machine which doesn’t suite there needs at all. This is not just a myth, it’s a fact! So, we would urge you to hold and go through these few steps carefully. Once you’re done, you will know what’s best for you. You will not regret it. Before we even start working on the problem of making a purchase decision, let’s just take a step back and think for a moment. You may remember we discussed that a mini-mill is the best friend of a DIY enthusiast. It’s the proper tool for a designer and a home engineer. Well, that’s really not enough to go on. To put it in simple terms, a mini-mill is a type of machine that can help with mending, molding and making small changes to wood or metal frames and other such parts. They are pretty limited in their capabilities as they take very little space. For this reason, they are ideal for small workshops and engineering houses. If you want to get the best mini mill, then the sweet spot for you should be $2000 to $5000, where you will find some really compelling options. If you are thinking of going lower, let’s say somewhere around 1000$, then you may get a good deal, but you will probably be sacrificing some performance. But whenever you are dealing with professional workloads, then it is probably best to make a worthwhile investment. By this, we are suggesting that you go all out, and get the best possible machine you can get your hands on. It will certainly cost more. But you are really not losing out on anything. So, we have covered the value proposition in this part. Generally, most of the time you will be dealing with vertical mini-mills, where the spindle axis is in the vertical orientation. This implies that the cutting tools are in a vertical orientation, meaning you have total usability control and can move mill around without much of an issue. Then you have the horizontal mills, which are a bit tough to handle than usual. These have a very niche application. Gunsmiths often have to use such mills, but that’s about it. There are no further use cases to consider. The orientation and positioning of the mill spindle are very important. The more movement you have the better. Now with mini-mills, you can’t really have all the movement in the world. You are limited, but the head and spindle should be capable of working in harmony, providing the best settings that allow the worker to properly position the cutting tool. The more freedom of opportunity you get, the better. 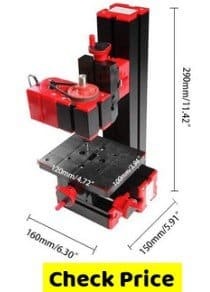 Any mini mill, almost all of the options out there, should have a table with wheels to position it properly with the head and spindle (unless it’s a very cheap option). It is one of the key flexibilities of a mini mill, and you shouldn’t have any problems in this regard. However, the limit of precision is very important. The best mini mill should be able to precisely control the table positioning by 0.001-inch in both axes. Now, this is a rough estimation, as different manufacturers have different standards. In order to achieve proper positioning, the surface you are working on has to as flat as possible. This also allows for better clamping capabilities, offering better precision and control. In terms of the motor power and its capabilities, then you can rest assured as many of the mini-mills come with motors with decent capabilities. What you do want, however, is the most powerful one available, which can take care of all your needs. Now with higher wattage comes a higher price tag, which is pretty obvious. But you’d probably get away with hard-to-handle materials. Also, do make sure that your working surface is strong enough to handle the requirements of the mini mill. Torque is one of the key factors that you should take into consideration if you’re looking for the best mini mill. Now the torque is basically the driving power of the tool, which needs to be both strong and variable, which allows for more dynamic use cases. Having a mill with variable speed control is better than having a single speed option because you would want to have a bit more headroom if you are dealing with tough metal or wooden parts. Belt driven options are also good for better performance output. So, be mindful of this particular thing as it is one of the most crucial deciding factors. These extra features come as an afterthought. Still, if you are getting an extra feature like perhaps a coolant integration or perhaps a better speed control system that gives you better usability, then that is a plus point. 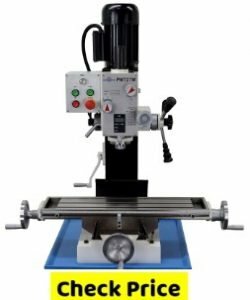 However, if you are thinking of purchasing a mini milling machine, then it’s probably better to look at some of the key features first and then decide whether or not you fancy any extra features. You can’t find all the features of a good mini-mill in one particular product. Now there is a very good reason for that. With different manufacturers, you will see different implementations. They take something that most people would use on a daily basis, then mold it by their standards and integrate this feature as one of their own. But what features can you expect from a good minimal? Well, here are the features which we think are really worth it. A mini milling machine needs to have a proper weight distribution. Now with machines like these, you should expect a bit heft because of the cast iron construction, which is another thing to take into account. So, a good weight to body ratio is expected. Build quality needs to be top-notch. Although with a mini mill, you will find poor build quality rarely. Still, it is something to keep in mind. Variable speed options is a must-have specialty for a mini mill. This way the user can find a lot of headroom to deal with tough projects. Movement freedom with the head and spindle is pretty common, but being able to hit that sweet spot isn’t always manageable. So, manufacturers should be aware of that. Pricing is a relative matter. But in order to be the best mini mill, it needs to have a good value for the money, which means the buyer should get a good blend of features and convenience. Now you may be wondering why we are being so abstract about the qualities. Well, as mentioned earlier, the manufacturers always try to put ‘their’ features into the mix, which is why there isn’t really a standardized way of saying these things. Also, your usability matters as well, which is why you need to be able to find out which features suit you the most. So, we can’t really bring standardized features in this case. Using a mini-mill is relatively easy considered to an industry-based milling machine. But before we begin, there are some steps regarding the setup, which we will also be covering here. Before getting started on a project, try to secure your workplace and machine of chips and burrs. Then you’d want to select a milling cutter. It is better not to go with a bigger size than necessary. Now you need to check whether or not all the parts of the machine have proper lubrication. You would want the parts to move around freely, maintaining a drag at the same time. We now have machines which can have bi-directional settings. Be sure to check whether the spindle setting is in the clockwise mode or counter-clockwise mode. Always feed the workpiece in the opposite rotation of the cutter. Never make any changes to the machine while it’s operating. Properly clamp the workpiece so that it doesn’t shake or vibrate in the machine table. Using a recommended lubricant is always a good idea. Now that you’ve everything set up, you can now start working on your project. There are 4-types of milling processes in general. Face milling is basically milling a flat wooden or metal surface which is positioned in a right angle with respect to the cutter. Slab milling refers to the process where you are dealing with a flat metal or wooden surfaces which are perpendicular to the cutter. Whenever you’re dealing with smooth and flat surfaces with an inclination with respect to the cutting surface, you can call it an angular milling. Last but not least, we have form milling, which deals with irregular forms of metal or wood. These are just the basic things that you should know before you start working with a mini mill. The steps are generalized in form, so you should have no problems getting acquainted with them. Before we leave, we would like to do one last thing. We would like to give you a few tips on milling machine safety. Always keep your hands away from the cutter as far as you can manage. Making direct contact with the cutter can be catastrophic. It is always a good idea to place heavy pads or something similar on the surface of operation before starting your work. Never try to tighten arbor nuts with the milling machine. Keep a smooth and soft cloth around to hold the cutter bits whenever you’re removing or installing them. It is always a good idea to set the cutter in the end to avoid mishaps. Avoid adjusting the workpieces when the machine is operating. Keep a brush and rake close by to clean the chips away from the workstation. Always shut down the machine to make any adjustments. Use splash guards to avoid splashes of cutting oil. This may seem a minor issue. But there is the possibility of severe accidents if precautions are not taken. It is time to say goodbye. Now there are a few things we would like to discuss before we can close the shutter and call it a day. Now you may recall about the sections where we shed some light on what features should a good mini mill have. Keep in mind, these features may not come in handy if you don’t know how to utilize them. As you may already know by now, there’s a lot going on with a mini mill. If you don’t know what you need it for, then you will probably end up losing money. Another important thing is brand value. The products which are here all come from reputable brands who have pretty good customer support (it may vary from region to region). In short, they will stand by your side whenever you’re facing a problem. So, even if you don’t like the products we showed you, you should probably look for a reliable brand first. That’s all for now, hope to see you again sometime.